The John M.S. Lecky UBC Boathouse offers a variety of team building and corporate experiences in both rowing and paddling sports. All team building experiences are customizable and can include room rental, catering and on water components. The UBC Boathouse is equipped to offer these experiences to all group sizes. Team building experiences can be created for groups of 12 or more. All packages include the necessary equipment, a coach and steers person and a safety orientation at the start of the program. Additional options for these packages can include catering, a meeting space or event space rental and customizable experiential coaching options. 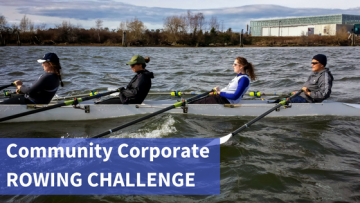 The Community Corporate Rowing Challenge is a 7-week rowing program for businesses, groups and clubs. Each crew practices twice per week. Teams will learn basic boat handling, rowing and racing skills in preparation to end the season at a championship regatta against other Community Corporate Challenge teams. Teams will train and race in quads. Each team will require six participants – 4 rowers and two alternates. One of the alternates will be used during practices to cox (instruct and steer) each boat. If your group would like to row outside of the times listed, it can be arranged. We will do our best to meet your needs. The Championship Regatta is where crews will put their skills to the test in a friendly and exciting competition. Crews are guaranteed two races (weather permitting). Team members should work for, or be a member of a club or organization. Spouses are eligible! For racing, quads must have a minimum of 1 woman. Coxswain should be small, have a strong voice and like issuing orders! Rowing sessions will be offered rain or shine.